SURJ PDX (Showing Up for Racial Justice Portland) is a local chapter of a national network of Showing Up for Racial Justice groups organizing white people for racial justice. Core: SURJ PDX is a volunteer-run organization. We have a core leadership group of about 12 past cohort members that rotates annually. The core group is responsible for running the cohort, organizational planning, and supporting our action groups. Additionally, a small admin team manages SURJ PDX email, website, and communications. Cohort: SURJ PDX hosts an annual cohort starting every January, which meets monthly for education, skill building, relationship and leadership development. The cohort is a closed group to support relationship building. We hold open cohort meetings on the fourth Monday of October and November for anyone interested in joining the following year’s cohort. Action Groups: SURJ PDX carries out our solidarity work in action groups, which are led by SURJ cohort members and open to the larger SURJ community interested in getting involved in our work. Depending on the project, some of our groups are open to anyone, and others require members attend a SURJ training before getting involved. Our current action groups are Black Lives Matter yard sign campaign, Interfaith, SURJ Families, Education Equity, and Immigration. Base Supporters: Our base supporters are community members that are excited about the work of SURJ PDX and stay in the loop through our community supporter email list. We send out monthly updates about SURJ and racial justice happenings in Portland, as well as periodic opportunities to get involved in our campaigns. Allyship: SURJ PDX builds and deepens accountable ally relationships in order to achieve victories for racial justice and contribute to local movement‐building efforts. Allyship is an active, consistent, and arduous practice of unlearning and re-evaluating, in which a person holding systemic power seeks to end oppressions in solidarity with a group of people who are systemically disempowered. Education: SURJ PDX works to develop or identify transformative education opportunities that sharpen the analysis, organizing skills and leadership of white anti‐racist organizers and the broader Portland community. 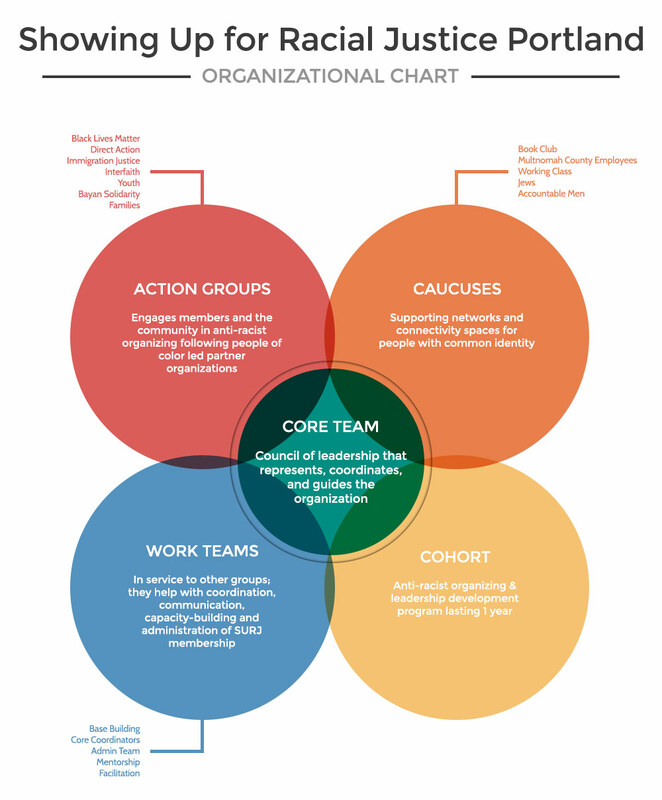 Leadership Development: SURJ PDX works to develop a core base of strong, consistent, active, long‐term organizers with formalized accountability to the racial justice movement. SURJ PDX balances internal work (educating ourselves and each other, leadership development, supporting mutual accountability, etc) with the external work of supporting POC-led organizing.